TRIPOLI (Reuters) - Lawmakers from Libya's two rival parliaments have signed a declaration of principles aimed at ending the North African country's civil conflict. The proposal was signed late on Saturday by two groups from the Libyan parliament and the rival General National Congress. The initiative is separate from United Nations-sponsored talks between the country's two competing governments and parliaments to form a united administration. 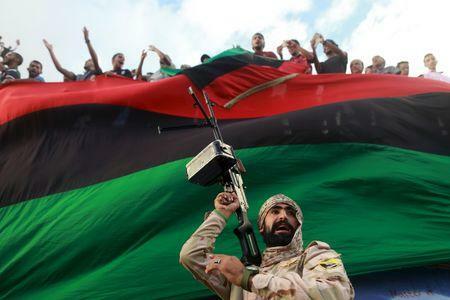 Four years after the fall of Muammar Gaddafi, Libya is in turmoil. Tripoli has been controlled since last year by an armed faction called Libya Dawn, forcing the internationally recognised government and elected parliament to work in the east. Lawmakers said the declaration calls for forming a 10-person committee - five members from each parliament - that would be charged with naming an interim prime minister and two deputies. Legislative elections would be held within two years. Delegates from the elected House of Representatives and the General National Congress said it was too early to decide on the proposal, which would have to be put to both houses for a vote. Western governments are pushing for the U.N.-backed agreement to form a government of national unity as the only way to end the chaos in Libya, where Islamic State militants have gained ground. Moderates have supported the U.N. proposal after a year of talks, but hardliners in both camps have been demanding more concessions from the other side. The U.N. proposal calls for an executive six-member presidential council that would try to represent Libya's traditional regional power bases, along with the House of Representatives congress and a second advisory chamber State Council.